Bob Goncalves served in the US Air Force. 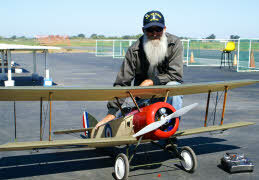 He flies radio-controlled planes, and does 3-D flying, which he tells us is a "whole different set". He has 15 RC planes in his hanger. 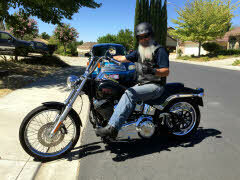 His other love is his 2009 Harley softail custom. Bob Himel has grown older and wiser. Bruce Burnett - I'm living in Anchorage, Alaska and have a wife and four kids. Candy (Breckenridge) Foster - After living in Concord until 1976 we moved to Auburn, California. I was divorced with 3 daughters. I remarried a man who graduated from CVHS in 1961. He lived on Ayers Road as a kid. We moved to Red Bluff, where he drives truck for Wal*Mart. My children are married, and I am a grandmother of 2. Carl Bengston - Lives in Turlock, California with his wife and two daughters. Carl was the head librarian at California State University, Stanislaus, in Turlock, for many years. He sent us an an update in 2016. Carol (Shepard) Guilfoyle - After graduating, getting married and having children, I went to work for Chevron in the corporate center in Concord. After leaving there, I worked part-time jobs while continuing to raise our children; a full-time job in itself. In 1993, IBM moved us to Oregon, where we've been ever since. We love it here, and yes, it does rain a lot! We raised three children, and now (2016) have 6 grandchildren and 3 great-grandchildren. Can we really be that old? We enjoy bowling and golfing, and especially enjoy camping in the great outdoors. I also love to do quilting, crafting, and making things for others. We are very active in our church, which keeps us pretty busy. My husband volunteers in the A/V arena, and I'm involved with Women's Ministries. In spite of some health issues, we continue to do as much as we can, just slower. It's been a fun, crazy, and very interesting 50 years! Carolyn (Engel) Douglas - I married a navy man and we lived a few years in Vallejo, California while he was teaching at Mare Island. We moved to Lincoln, Nebraska in 1978, raised our 3 daughters and retired from our jobs there. We moved to sunny New Mexico in 2011 and like it very much.